If you love Mexican food and are looking for an easy weeknight dinner you must try these enchiladas. I kid you not they take maybe 10 minutes to make and are so tasty. I have made them twice in the last two weeks. Little confession I love the bean burritos at Taco Bell, I used to eat them all the time. Now I rarely eat them but man I dream about them. These enchiladas are kind of my attempt to recreate the burritos with a twist! I really recommend making these with the refried beans with either the jalapenos or green chiles, it just gives the burritos more flavor. When we made these we served Mexican Street Corn as a side and it was a great meat free meal. You can easily make these ahead of time and keep in the fridge til you are ready to bake them! Take one package of the enchilada sauce and pour in the bottom of a rectangle baking dish if you use the enchilada sauce in a can this would probably equate to about 1 cup of sauce. In a bowl mix together the refried beans with the diced onion, cheddar cheese, 1 tablespoon cumin, 1 teaspoon chili powder, and 1/2 teaspoon paprika. Take a flour shell and fill with the bean filling and roll up and place it seam side down in the dish. You should have enough filling to make 7-8 enchiladas. In a bowl mix together the remaining packet of enchilada sauce with the sour cream, 1 teaspoon cumin and 1/2 teaspoon chili powder. Pour this over the rolled enchiladas. Then top with Monterey jack cheese. Bake at 350 degrees about 35- 40 minutes until cheese is bubbly. Top with cilantro, avocado, salsa and/or sour cream before serving if desired. 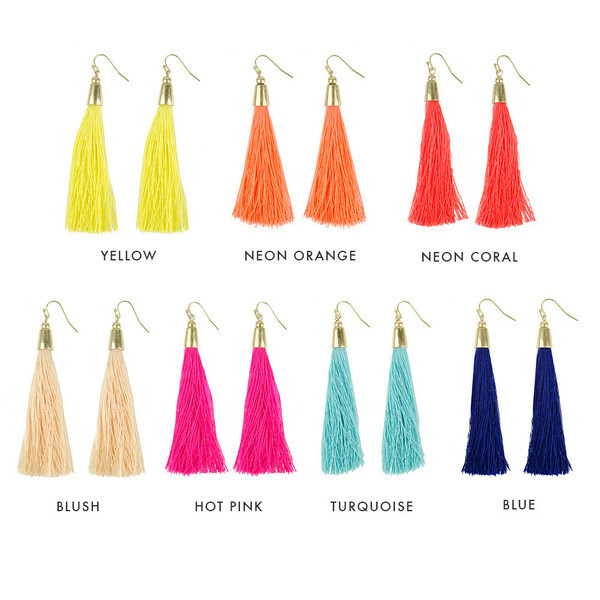 I am currently having quite the obsession with tassel earrings. They are such an inexpensive way to make a fun statement. Most of mine are solid colored so I liked these were colorblocked. The tee below is the one I mentioned on my obsessions post last week. I ordered it and like it so much I am ordering a second color. It runs TTS, I however ordered a medium because I like my tees on the looser side. I am thinking of ordering the white next, I always can use a good white tee. Both the tee and earrings are only $36. Another pair that I have received many questions about since my Dallas trip are now online! I am wearing them in the picture below. They come in 7 different colors. I am wearing the blush color. 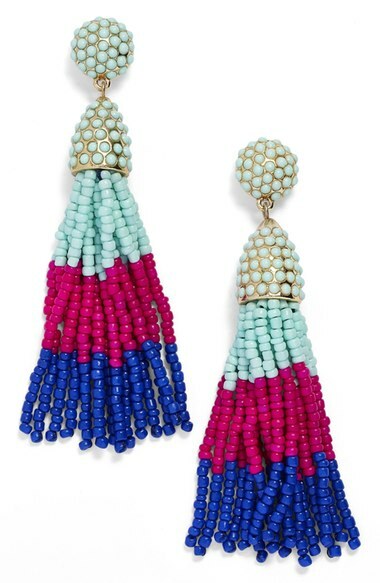 The great thing about these earrings is they are super lightweight. I seriously love all the colors. I could TOTALLY eat a Taco Bell bean burrito right now haha!!! It would be delicious, but I would be so mad at myself for eating it later! Since when did Nordstrom start selling Baublebar? I love them and I am digging your earrings! Definitely going to take a swing at those enchiladas soon, yum! !